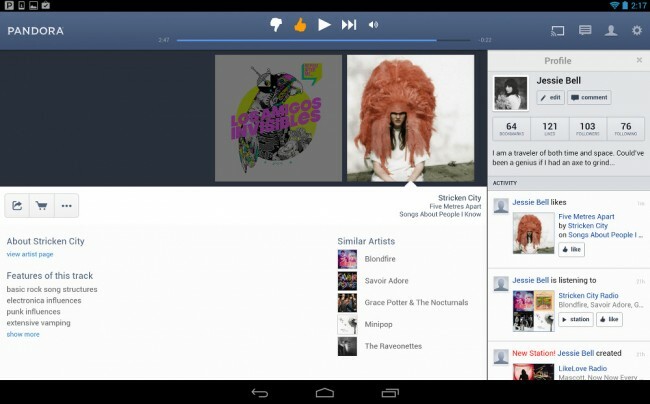 Pandora users – if you still exist – your tablet experience on Android has finally arrived. After a revamped tablet UI surfaced for the iPad back in September as iTunes Radio was launching, we once again wondered when the streaming music service would stop ignoring the most popular mobile OS on the planet and show us some love. Thankfully, we have to worry no longer. The new Pandora 5.0 should work with “hundreds” of different big-screened Android devices. Enhanced Listening Experience & Personalization – App interface is optimized for larger screens and features upgraded core Pandora functionality, such as adding variety to a station and viewing station details, in addition to the ability to easily shuffle, rename and delete stations. Deeper Music Discovery & Exploration –Explore more about the artist and album that is currently playing with enriched artist pages that include similar artists and genome traits of the current track playing, plus lyrics, artist biographies and album discographies. Your Personal Profile & Music Feed – Your detailed timeline Capture your music preferences on this detailed timeline, such as stations created, bookmarked tracks and thumb history and choose to make your profile either public or private. The Music Feed offers a centralized place to view music activity, making it easy to explore what friends and other listeners with similar musical tastes are discovering and enjoying on Pandora. The Ability to Connect & Share Music with Friends – Social sharing features are now easier than ever to navigate on Android tablets with the updated user interface. Listeners can publish their music activity to Facebook with the Pandora Timeline app, as well as manually share links to favorite stations with followers on Twitter. So there you have it! We’re personally big fans of Google Music All Access, but we’ll take a tablet UI for Pandora, even if it is a couple of years late. Update: Is that a Chromecast icon in that screenshot? Since Pandora doesn’t officially support Chromecast yet, I think it’s fair to assume that it is coming.